Wayne Quinton died at 94. Wayne Quinton helped develop the device surgically implanted in an artery that allowed patients with kidney failure to receive regular, lifesaving dialysis. Before graduating college at age 38, Wayne Everett Quinton worked at Boeing, ran an instrument shop at the University of Washington School of Medicine, and designed and created revolutionary devices still used in the medical field today. He earned his mechanical-engineering degree in 1959 before leaving the UW and founding Quinton Instruments, one of the oldest medical-device companies in a region now known for its robust biotechnology and biomedical sector. Friends and colleagues say the degree wasn’t that important. “The important thing was that (engineering) was in his soul,” said Buddy Ratner, a UW bioengineering and chemical-engineering professor. Mr. Quinton died in his Highlands home Jan. 22 of congestive heart failure. He was 94. Known for his role of merging the fields of engineering and medicine, Mr. Quinton became one of the first practitioners of bioengineering and played an integral role in forming UW’s Center for Bioengineering in 1967; the field now has its own department. Mahoney explained that it was Mr. Quinton’s raw curiosity that led him to studying more than one discipline. While he earned a degree in mechanical engineering, he took classes “all over the place,” she said. Because of that, he was able to do something many engineers couldn’t — speak physician. Perhaps most well-known is Mr. Quinton’s work with kidney dialysis. He worked with UW doctors Belding Scribner and David Dillard to develop the device surgically implanted in an artery that allows patients with kidney failure to receive regular, lifesaving dialysis. Another well-known invention is the lightweight treadmill, which Mr. Quinton used regularly throughout his life. He valued exercise and ran 19 marathons, his wife, Jeanne Quinton, said. He did not invent the treadmill, which can be dated as far back as the 1800s, but his much smaller, lightweight design is the parent of what is now seen in fitness centers and used in cardiac-diagnostic centers for stress testing. 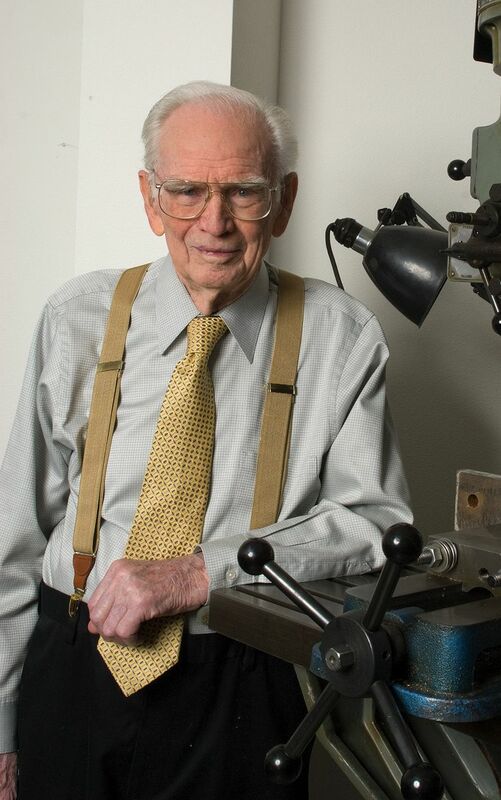 Even after selling Quinton Instruments in 1984 and retiring in 1991 at age 70, Mr. Quinton continued inventing, working in his “heaven” — a complex built into his Highlands home that included a design office and two underground shops. “My definition of retirement is doing what you want at the pace you want to do it,” Mr. Quinton said in a Seattle Times interview at the time. Friends and former colleagues say even though he had long been retired, he didn’t stop thinking about medical devices. “And he still saw places he could make contributions, even then,” Ratner said. Jeanne said her husband was working in his shop until about two months ago when he had to go to the hospital. In addition to his wife, Mr. Quinton is survived by his son, Randall; daughter, Sherrie; three stepchildren, Lisa Richardson, Dana Roberts and Joe Jackson; 18 grandchildren; and six great-grandchildren. He is preceded in death by his grandson Oliver. Services were held Jan. 31 at The Church of Jesus Christ of Latter-day Saints. In lieu of flowers, the family asks that donations be made to the University of Washington Medical Center or Brigham Young University College of Engineering.